The digital signage system from Orangevalley is a low cost cloud based signage system incorporating all the latest web technologies to enable you to quickly and easily display information on signage screens throughout your organisation. 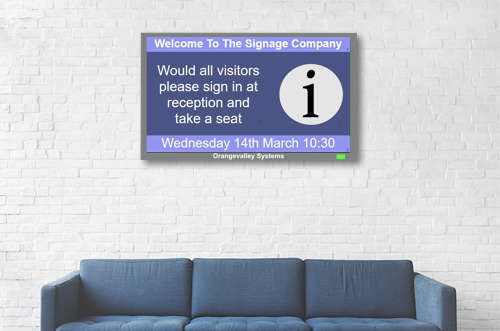 This can be a single display screen in your reception area or waiting room showing visitor welcome messages, to multiple screens in different departments or even different parts of the country via the cloud. 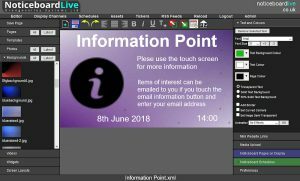 Fast web browser based controller built to operate like normal desktop software gives you all the control you need over your signage screens. 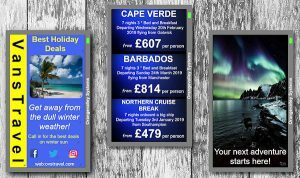 Nobody want's to spend more time than is really necessary putting a message on a digital signage screen so the control system has a powerful built in page editor that enables the quick creation of message pages. Single or multiple display pages can be sent to a display channel directly or put into a separate playlist that can be sent to any display channel now or in the future. Signage pages and playlists can be scheduled for display any time in the future. All sections of the controller have small page previews (top right) so you don't have to keep looking at the editor to check you are using the right page. 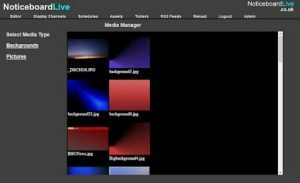 Manage your uploaded assets with the asset manager. Signage screens often have a scrolling text 'ticker' message running along the bottom of the screen. 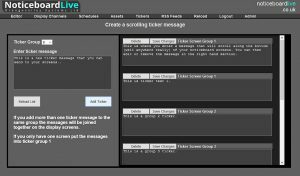 This section allows you to add tickers messages and even join different ones together. The signage player is the device that connects to the display screen for showing content. Read about our multi-zone player where you can split the screen up into zones, where each zone displays its own channel of information and behaves like a completely independent signage screen. Our signage systems and software have been installed in many sectors that include the oil industry, shipping, healthcare, hotels, education, the nuclear power industry and many others. We are also happy to consider custom software solutions for your specific signage functionality.